If you're looking for the general plan I said I'd use to describe every Greek island, I'm sorry, you're not going to find it. 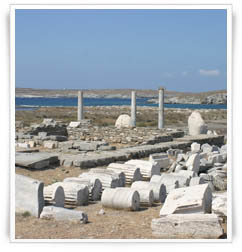 See, Delos is not like any other island. I can't start telling you stories of my experience there, how I got there and what I did. It would be like talking about the Stonehenge and talking about how I spilled some cola on the ground (I didn't, it's an example) instead of focusing on what matters. 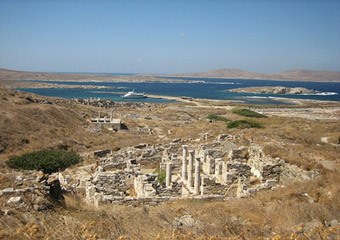 See, Delos is an island of history, an open-air museum, a nirvana for archaeologists. What do most books say? 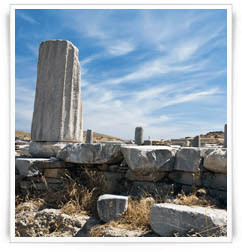 Well, first of all, that Delos is one of the most important archaeological sites in Greece. Of course, you will never find a book that refers to a site as THE most important, there's one too many to choose. 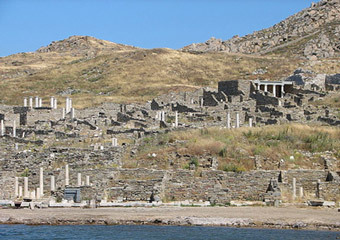 But if there was a list, Delos would be pretty high on it, up there with Acropolis and Knossos. Anyway, they also say that Leto, pregnant by Zeus, gave birth to Apollo there. Some describe it as tiny and uninhabited with no water and low hills and some say that it's full of ruined houses, temples, statues and mosaics (duh). So, what do I say? Well. nothing. There's no word that will do a place like Delos justice, and I'm not saying this because I'm too bored to sit down and try to find a way to paint a picture. I'm not saying it because I think it will impress you and make you want to visit it more either. I'm saying this because I believe it. 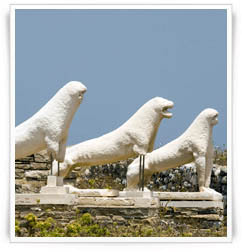 Besides, you can't visit Delos alone - it's a package deal, together with Mykonos. You can't even stay overnight (I guess the word 'uninhabited' I used before clarified this) and the boat schedules only allow a maximum of 6-7 hours there. I told you, Delos is different. Sections like "places to see", "beaches", "food" and "nightlife" would only stay blank if I followed the plan I've come up with. What would I say about food? "Visit the one and only cafeteria of Delos"? That would be a laugh. Besides, don't even bother; bring your own water and food, if you don't want to be robbed and eat something of poor value. Anyway, that's not the point. The point is all I can do now is give you a somewhat brief description of what is what in Delos. So, here goes. First there is the Agora of the Competalists. Compita were Roman citizens or free slaves and they worshipped the Lares Competales, or else "Crossroads Gods". On your left from there you will find the Processional Way that will lead you to the Sanctuary of Apollo, announced by the Propylaea. The Propylaea is a gateway built of white with temples and statues. The first thing you notice when you enter the Sanctuary is the House of the Naxiots just next door, which is in fact a temple commissioned by the inhabitants of Naxos in the 2nd half of the 7th century BC. Just next you will find three temples in a row. The first and largest is the Great Temple of Apollo, begun by the Delians in 476 BC. Second is an Athenian temple of Pentelic marble, while the third and smallest is the Temple of the Delians, made by the 6th century Athenian tyrant Pysistratos to house the sacred Asteria. 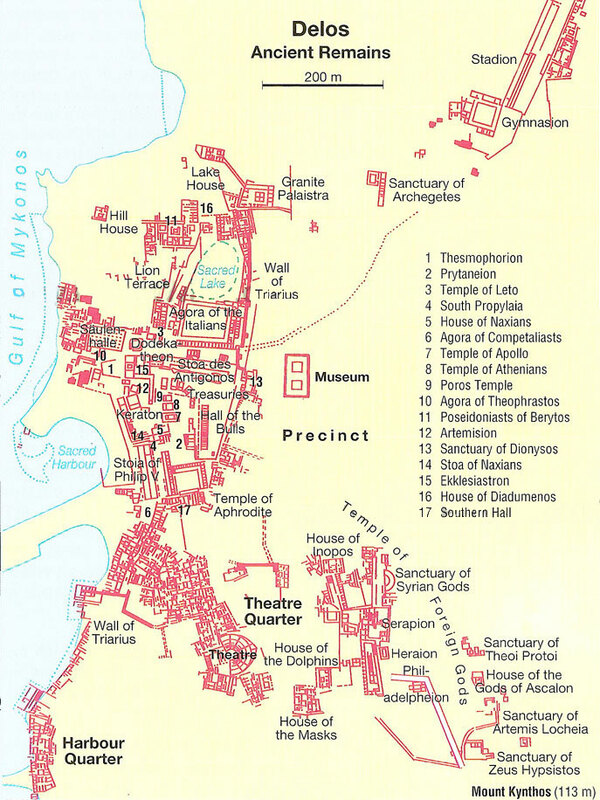 Beyond the Sanctuary lies the Lion District, the urban centre that was built in the Hellenistic Age. You enter it by the Italian Agora, through which you reach the Temple of Leto and the Dodecatheon (=twelve Gods), dedicated to the 12 gods of Olympus, in the 3rd century BC. Next comes the famous Terrace of the Lions. 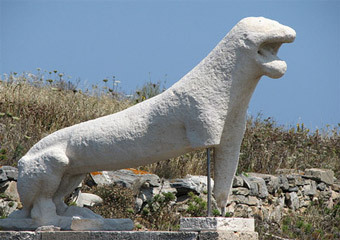 The Lions were made from Naxian marble in the 7th century BC. They were originally nine, but one now sits by the arsenal in Venice and three have permanently gone missing. 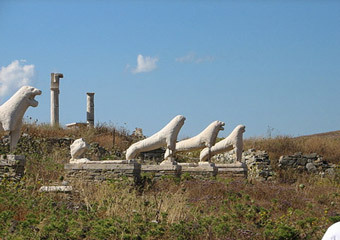 Continuing along the Sacred Way of Delos, a little further on, you reach the four tall columns of the Institution of the Poseidoniasts. The site museum is quite nearby. Most of the good parts of course are either scattered along the island or in the Archaeological Museum of Athens, but it still has an absorbing collection.The lions from the Terrace I mentioned just before will come to its defense (those on the terrace itself are replicas). Next is the Terrace of the Foreign Gods. The ruins of the Sanctuary of the Syrian Gods date from 100 BC, with a small religious theatre inside. 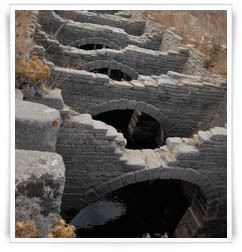 Right next is the first of the three 2nd century BC Serapeions. These three temples are dedicated to Serapis, the first and only successful god purposely invented by man. 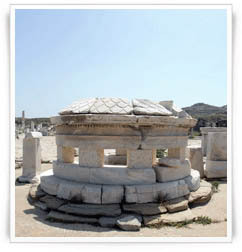 Between the first and the second Serapeions stands the Shrine to the Samothracian Great Gods. The third Serapeion that perhaps was the main sanctuary, still houses half a statue. 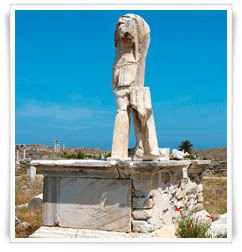 Further on, to the left of the Heraion, a temple dedicated to Hera from 500 BC, steps lead up to the top of Mount Kythnos. On the way up you will find the Sacred Cave where Apollo ran one of his many oracles, later dedicated to Heracles, while on the mountain you will find the Shrine of Good Luck, built by Arsinoe Philadelphos, wife of her brother, the king of Egypt. 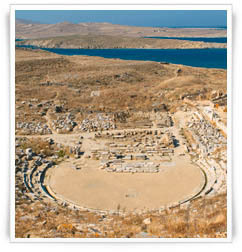 If you retrace your steps to the Heraion and turn left towards the harbor, you will meet the Theatre Quarter that surrounded the 2nd century BC Theatre of Delos, with a 5500 capacity. The houses here date from the Hellenistic and Roman ages. Each house has a special name and a special something that makes them unique. The House of the Dolphins and the House of the Masks, for example, have beautiful mosaics. The House of Cleopatra has headless statues of the owners. One of the grandest houses is the House of the Trident though. That's pretty much what Delos is. 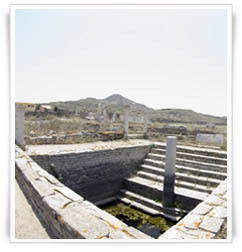 I could refer to other things, such as the islets that surround Delos or smaller sites like the Minoan Fountain, but you will find out about them anyway when you tour this magnificent island. All I can tell you is: bring water, bring food, wear sensible shoes, get organized or hire a guide and. have fun! 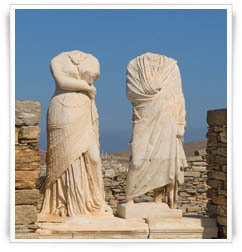 Delos may not be the flashy lots-of-people-dancing-their-eyes-out kind of fun, but the all-the-history-you-can-digest kind can be just as amazing, don't you think?